This new series for the very young highlights the defining characteristics of habitats, including the plant and animal life, using examples from around the world. 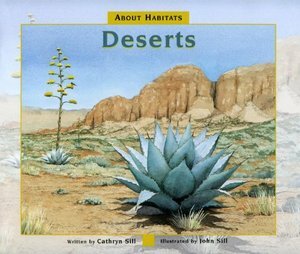 Award-winning author Cathryn Sill and her husband, noted wildlife illustrator John Sill, offer young readers a first glimpse into desert habitats. In simple, easy-to-understand language, this guide teaches children what deserts are, what kinds of animals and plants live there, and how certain species have adapted to the unique challenges of surviving in this harsh environment. John Sill's beautifully detailed, full-color illustrations reflect the diversity of desert topography-- from the vast dunes of the Arabian Desert to the rocky Chihuahuan Desert in the southwestern U.S.-and the astonishing varieties of desert wildlife. A glossary and afterword provide young readers with further fascinating details on the desert, its creatures, and its conditions.